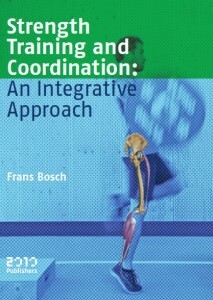 Dutch coach Frans Bosch started quite the conversation last year when he released the English edition of his book Strength Training and Coordination: An Integrative Approach. A look at how training methods have evolved over the last century shows a clear trend towards more specific training means. But so far there has yet to a clear look at comprehensive look at the topic in detail. Bondarchuk has written in detail about the connection between specificity and transfer, but does not spend much time answering why things work that way. Verkhoshansky wrote a book on the topic but the exercises he describes often do not fit into his own definition. Bosch’s book attempts to do just that by taking a 360-degree look at the topic. It puts specificity in context by looking at how we coordinate our bodies and how best to develop that coordination. → Learn more about how Bosch applies these principles in practice by purchasing the book in the HMMR Media Store. Bosch draws a lot on the work dynamic systems theory. Despite the fancy name, the theory is just that human movement is the result of a highly intricate network of co-dependent sub-systems. Not only do we have different bodily systems, but we also have different contributors to each. If you look at running, for example, performance is tied to diverse elements such as muscle fibers, neural control, elastic properties, distribution of loads over many joints, the respiratory system, and more. Chapter 2 alone looks at anatomy and the many limiting influences on force production. No single item works on its own and even the smallest factors may, in interaction with other influences, have a major impact. Dynamic systems require a flexible approach, but just because something is flexible does not mean that everything is constantly changing. In order for movement to respond to the environment it needs both fixed elements (attractors) and changeable components (fluctuations). For every degree of freedom there is an energy cost and attractors act to reduce the degrees of freedom to create more efficient movement. Fluctuations are the components the remain to help us adapt to the environment. Ideally we have enough of them to adapt and no more. Bosch spends chapter 3 looking at how to analyze sporting movements and provides an example from baseball. When a batter swings at a ball some things need to remain stable while some things need to be flexible in order to adjust to the type and location of the pitch they receive. The result is that the arm movement acts as a primary attractor, while the bend of the trunk, the rotation of the pelvis, and front knee flex act as fluctuations to adjust ot the oncoming pitch. In the book Bosch also provides great examples of key attractors for agility in sport. This analysis is key because it dictates where our attention goes as a coach. Japan rugby strength coach John Pryor discussed in our interview last year about how he tailored his programming to enhance two key attractors he identified for his backs leading into the World Cup. We need to analyze our sporting movement, define our attractors, and focus our attention on finding exercises that will strengthen the attractors. I stole the line above from Vern, but it is the essence of Bosch’s approach. Not only do we need to focus on coordination in strength training, but we need to bring a flexible approach to coordination. If we create rigid rules that only apply in certain situations, then athletes will fail when they encounter something new. Instead we need to teach the body rules that we can apply in different situations. In the language of Nassim Nicholas Taleb, we want to create antifragile athletes and not fragile athletes. Above we defined the attractors for our sport; the next step is to help the body apply them in more situations. We can do this by creating a better learning environment. How do we improve technique and movement patterns? The common mantra is that perfect practice makes perfect performance, but in reality movement is improved not by exploring its core (i.e. perfect technique), but by exploring its limits (i.e. where it breaks down). You have to constantly test and push the body to its limits in order to improve. Athletes will fail in this zone, but in the right environment they can also learn to do things better in the process. Keep the pieces together – We can learn by break things down (part method) or keeping them together (whole method). Where possible, keep things together. As discussed above, the body needs help building those links and does not function well unless each part is connected to the result you want. Think outside the body – All too often I tell athletes what to do with a muscle or limb, but the body thinks in terms of movements and not muscles. Research has shown that movements can be better controlled when the focus lays outside the body rather than inside it. Therefore thinking about the intention of the movement rather than the flexion of the muscle helps. This type of thinking is lacking in the weight room. We need to find strength training exercises with a similar intention to the movements we are training for. Focus your feedback – Feedback can come in various forms. For example the movement itself can provide feedback (intrinsic feedback) or the feedback can come from an external source like pictures or a coach (augmented feedback). Furthermore, augmented feedback can come from the knowing the performance or knowing the results. Each type of feedback is different and coaches need to be aware of how feedback functions. For example one famous study on discus throwers showed that they achieved better results when feedback was simply from a tape measure compared to active coaching instruction. Augmented feedback must also be translated several times before it is heard, which can increase noise and lessen its impact. You will become a better coach once you start analyzing how your athletes are receiving feedback and designing exercises that give them feedback without you needing to say a word. Differential learning – adding variation to training will force the body to learn because the constant change forces adaptation and self-organization. Change also helps keep motivation high, and motivation is crucial for learning. Choose exercises with lots of variation, but that keep a similar intention throughout. Variation can also come in different forms such as changing the environment, changing the task, or changing the organism. We often focus on adding variation in just one or two areas, but all can be very effective tools. For example changing the organism by pre-fatiguing an athlete can help develop technique that will be stronger under pressure. Just like the fourth law of ecology, there is no such thing as a free lunch. Everything comes with a cost. As coaches we often focus on what positive transfer and exercise has, but there is always a negative transfer too. The reason for this dual impact is that strength training is founded on the search for overload, and there is a negative relationship between overload and specificity. Overload creates a benefit in one area, while reducing the specificity and potential transfer. Coaches then have to find the sweet spot where overload and specificity are at a good balance. The overload is what provides the training stimulus, and therefore we need it and it is worth it to step away from specificity for that purpose. But the easiest way to maximize overload is to reduce the degrees of freedom (i.e. higher loads can be achieved on a leg press machine than a one-legged squat) and this prevents self-organization. The sweet spot will be different for each athlete and each sport, and it is up to the coach to find the area where the positives outweigh the negatives. After these points have been implemented, the last step is to eliminate the waste. Training should be both effective and efficient. Efficiency is created by eliminating superfulous movements or loads that have a negative impact: “Every strength exercise creates loads that are not relevant to the execution of the sporting movement, and this additional stress is often actually damaging to performance.” What we are left with are exercises that are specific, helpful, and efficient. As I mentioned at the start, none of these items are that revolutionary on their own. Finding the sweet spot between specificity and overload is something most coaches already look for. While we often debate where that spot lies, it is because we may disagree on evidence rather than the need for this approach. By highlighting these topics, Bosch has made me rethink my own approach. Some stuff I have discarded. Some stuff I have changed. And even though I have kept most of what I do, I view it through a different lens now. I seldom read books on training since I find that they rarely change what I do. I find more benefit from exploring new topics and interests outside of sports. But Bosch had me thinking and I cannot ask for anything more from a book. → Keep reading: You can purchase “Strength Training and Coordination: An Integrative Approach” in the HMMR Media Store. Any thoughts on what Frans may think of the present state of middle distance running? Too many garbage reps…or steps?